Allan Holdsworth stands as one of the most remarkable and innovative musicians of the past four decades. His unique approach to playing guitar made him not just one of the most intelligent musicians on the progressive scene, but a huge influence on the likes of Alex Lifeson and John Petrucci. The British guitarist, born in 1946, first got noticed on the 1969 album ‘Igginbottom’s Wrench from the UK progressive band ‘Igginbottom. In the 70s, he played with cult prog bands such as Nucleus and Tempest, before adding his talents to the likes of Soft Machine (he appears on 1975’s respected Bundles), The New Tony William’s Lifeline, Pierre Moerlin’s Gong (Gazeuse! and Expresso II) and appeared on Jean-Luc Ponty’s Enigmatic Ocean (1977) . And in 1978, as proof his growing stature, he played on Bill Bruford’s solo album Feels Good To Me. It was the drummer who suggested Holdsworth should join Eddie Jobson, John Wetton and himself in U.K. His playing on the band’s self-titled debut album helped to shape their sound, but the guitarist subsequently quit, because he felt their approach to live performances hampered his love of improvising. But he and Bruford stayed together for the Bruford album One Of A Kind. By 1982, he was the acknowledged leader of I.O.U, who released an acclaimed, self-titled album the same year; it was hailed as being a jazz fusion masterclass, with Holdsworth truly blossoming as a genuinely magnificently fluent guitarist, capable of going in any direction he felt was required. Thanks to Eddie Van Halen, a devoted fan who once told Guitar World “To me, Allan Holdsworth is Number One”, Holdsworth was signed to Warner Brothers, with the Road Games EP coming out in 1983; not only did this feature Jack Bruce on vocals, but got Holdsworth a Grammy nomination in 1984 for Best Rock Instrumental Performance for the title track, a sign that he was getting more mainstream attention. But Holdsworth soon left the label, feeling that it wasn’t right for his artistic integrity. His album Atavachron, issued in 1986, was a landmark because it featured the man playing the SynthAxe. In the coming years, not only was he closely connected to this cutting edge instrument, but became the public face of the SynthAxe. At the end of the 80s, Holdsworth was brought in to guest with Level 42 for live shows in London following the death of their guitarist Alan Murphy, subsequently playing on their 1991 album Guaranteed. But by the mid-90s, his output had slowed right down, because of personal issues. But he still found time to tour in a supergroup with drummers Terry Bozzio and Pat Mastelotto, plus bassist Tony Levin; they performed improvised experimental music, which was very much his forté. He appeared on Derek Shenrinian’s Mythology in 2004 and he was also part of Sherinian’s progressive metal band Planet X, featuring on 2007’s Quantum. Holdsworth’s last all new solo studio album was 2001’s Flat Tire: Music For A Non Existent Movie, although in 2015 did put out the compilation album Tales From The Vault, which did include some new material. This year he was the subject of a box set containing all his solo albums bar 1976’s Velvet Darkness (essentially rehearsal tapes Holdsworth did not recognise as a genuine solo debut), entitled The Man Who Changed Guitar Forever, and a double compilation album. Eidolon: The Allan Holdsworth Collection, both released on the Manifesto label. 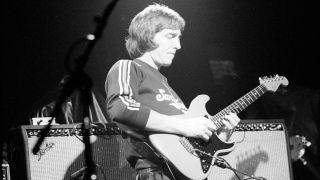 Allan Holdsworth was regarded as a highly complex musician, someone who combined jazz and progressive ideas in a manner that set him apart from anyone else. What he did was often felt to be unusual and challenging, and his own sources of inspiration ranged from John Coltrane to Django Reinhardt, Joe Pass and Wes Montgomery. His own peripatetic search for fresh ways to express himself through music made him not just one of the most technically gifted guitarists of his generation, but someone who had an extraordinary in depth knowledge of music. All of this made Holdsworth much admired, and ensured he stood apart from everyone. His 12 solo albums, as well as his work with other artists, puts him firmly among the elite of progressive musicians. He was not only ahead of his time, but his music sounds timeless and outside of any easy categorisation.